Earth Day Match Extended! Our Board of Directors and President's Circle members were so impressed by the support we received, they've offered up an extra $50,000 in funds to match any donations made through April 30th 2-for-1 up to a total of $200,000! This year marks the 40th anniversary of the Endangered Species Act (ESA), a truly landmark law that solidified our commitment to conserve our nation’s wildlife. We have had many successes. Bald eagles once again soar through our skies. Pelicans now surf the waves on the beaches of Florida, California and as far north as Maryland. Black-footed ferrets, once thought extinct, are coming back to the Great Plains. In Florida, even manatees are increasing in number. But even as we celebrate these amazing successes, there are some troubling warning signs regarding our nation’s long-standing commitment to conserve imperiled wildlife. Two years ago, wolves in Idaho and Montana and parts of Washington and Oregon were booted off the endangered species list by Congress—the first time that lawmakers, not biologists, decided to delist a species that was just turning the corner on the long road to recovery. This was a dark day, not just for the wolves, but for endangered species protections in general because it started the ball rolling for more attacks on the ESA. Various members of Congress have repeatedly introduced legislation to wave ESA protections, to cut off funding for particular listed species and to block and overturn listings of imperiled wildlife. In addition, the U.S. Fish and Wildlife Service (FWS) is retreating from past efforts and policies to fully recover species—the wolf is a perfect example. FWS has taken the politically expedient way out by proposing a nearly nationwide delisting of the gray wolf even when there are still huge areas of suitable, unoccupied habitat for wolves in California, Colorado and Utah and in Oregon and Washington, where wolves are still struggling to come back. FWS also has abandoned the dunes sage brush lizard in Texas and the fisher in the Northern Rockies, among others, refusing to protect these species even though the evidence is clear that they need serious help to survive. On the ESA’s 40th anniversary, we need to recommit ourselves to the conservation values that led to the enactment of this landmark law and ensure that these wildlife treasures are around for future generations to enjoy. There will be lots of opportunities to speak out for wildlife in the near future. I hope you will be one of the voices. Renewable power comes with many benefits. The catch is finding ways to make it “smart-from-the-start” when it involves wildlife habitat. Despite their outsized place in pop culture, great white sharks remain poorly understood. It wasn’t all that long ago that Mexican gray wolves roamed freely, their howls echoing through the southwest. Having colorful little fish darting around a home aquarium appears harmless enough, but the hobby can also have hidden environmental costs upstream. The waterways of the United States and other industrialized nations are awash with the miracles of modern living. The prairie pothole region of the Great Plains is the most important and most embattled waterfowl habitat in North America, and it’s long had an ally in the United States Farm Bill—until recently. Habitat destruction from plowing the land for crops, exotic diseases and widespread poisoning of its prairie dog prey almost caused North America’s only native ferret species to disappear for good. America’s rich wildlife heritage exists today, thanks—in no small way—to the ESA. Bison gained rights to some of their old stomping grounds on the Great Plains when the Montana Supreme Court in June reversed a lower court ruling that had prevented their return. 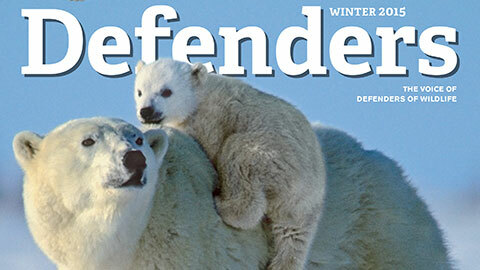 With engaging stories and spectacular photography, Defenders magazine gives readers a closer look at our efforts to protect imperiled wildlife. Building a massive, impenetrable barrier along the U.S.-Mexico border would wreak havoc on wildlife, critical habitat and communities. Tell Congress not to use your taxes to fund the end of the road for wildlife!